It could be that they feel that the F-35 can penetrate to the targets itself and doesn't need the standoff weapon? What precludes the JASSM from being carried internally? Is it too long or is the cross-section too large for the bays? I would have thought that they would push the SDB-II into 4.1 as well? SDB2 is Block 4 (unknown which one). Now that I think about it, JASSM-ER's mission would likely be met by JASSM on the F-35. Was there any mention of JASSM or LRASM in Block 4 in that AvWeek article? As technologies for long-range air defense improve and proliferate, the U.S. military has long sought a counter—missile that can strike land-based targets from hundreds of miles away. In the mid-1990s, the U.S. Air Force and Navy partnered to develop the AGM-158 Joint Air-to-Surface Standoff Missile (JASSM), but it was not deployed until 2009 and had limited range due to its Teledyne J402 turbojet engine. Now the Pentagon believes it has a more effective weapon in the JASSM extended-range version (JASSM-ER), powered by the Williams International F107 turbofan and with a range exceeding 500 nm (926 km). It is being integrated on Air Force fighters and bombers, including the Lockheed Martin F-16, Boeing F-15E and B-52 and Northrop Grumman B-2. These aircraft can already carry the legacy version of JASSM but require additional integration to take full advantage of the AGM-158B’s superior range and performance. Once equipped, they will be capable of destroying high-value targets over an area of 785,398 nm². Despite partnering with the Air Force in the early stages of the program, the Navy has no immediate plans to adopt the land-attack cruise missile for its strike fighters. The service has instead developed a ship-killing variant for its Boeing F/A-18E/F Super Hornet called the AGM-158C Long-Range Anti-Ship Missile (LRASM). Alan Jackson, director of strike systems at Lockheed’s missiles and fire control division, confirms that the JASSM-ER has been integrated with U.S. Air Combat Command’s fleet of F-15E Strike Eagles. Coming up next will be integration with the F-16 and B-52H, including external and internal carriage. Air Force budget documents state that the missile will be integrated with the F-16C/D Block 40/42/50/52-series fighters and a contract for nonrecurring (one-off) engineering was awarded in March. There is also some work left for the Strike Eagle, specifically integrating the F-15E’s Northrop Litening Advanced Targeting Pod. For bombers, the B-52 can carry up to 12 JASSM-ERs on its wings and with the new 1760 Internal Weapons Bay Upgrade, another eight internally. The only other aircraft that can carry more JASSM cruise missiles than the B-52H is the B-1B, which accommodates 24 missiles inside its internal weapons bays. Brig. Gen. Michael Schmidt, the Air Force’s program executive officer for fighters and bombers, confirmed during a recent interview that the B-2 Spirit bombers of Whiteman AFB, Missouri, are also slated to receive JASSM-ER. The B-2’s primary mission is nuclear deterrence, but the JASSM-ER provides a long-range, conventional option for striking high-value targets from outside the range of counterstealth radars and interceptors. The B-2 will require some changes, and development should start by mid-2018, Air Force documents state. In terms of capability upgrades for the missile, the service highlights some plans in its fiscal 2018 budget proposal. It includes funding for studies of an anti-radiation homing system for targeting radio frequency emitters such as radars and communications sites. The service wants a weapons data link for passing updated targeting information to the missile midflight, enabling JASSM-ER to hit relocatable or roaming land and maritime targets. Under a recent government contract, Lockheed is developing an improved wing that will add greater range and performance. The missile is accurate to within 3 m (10 ft.) of a target using the onboard imaging infrared seeker, or within 13 m when only guided by GPS-aided inertial navigation. The continued rollout of the JASSM-ER comes as flight testing of the anti-ship derivative begins on the B-1B for fielding in 2018 and the F/A-18E/F in 2019. Jackson says LRASM retains all the features, targeting capabilities and low-observable characteristics of the JASSM-ER but adds another passive sensor produced by BAE Systems. He would not say what type of sensor it is or what part of the electromagnetic spectrum it operates in, but it is probably a semi-active radar homing device. Once LRASM is introduced, the B-1B and the Navy’s Super Hornet will be capable of destroying land targets as well as moving vessels at sea from significant standoff ranges. Jackson says the Navy has no plans to adopt the less expensive JASSM-ER for striking land targets, even though it would be quicker, cheaper and easier to integrate LRASM and JASSM-ER at the same time rather than separately. JASSM and LRASM are produced by Lockheed in Troy, Alabama. The Air Force intends to procure JASSM cruise missiles at a rate of 360 per year. The missile is a major international sales opportunity for Lockheed, as it has already been adopted by Australia, Poland and Finland. Other foreign sales could materialize, particularly for trusted operators of the F-16, once integrated. Australia’s Super Hornets would be obvious candidates for the JASSM-ER and potentially LRASM. "You could do that, but it would be wrong." “We’re already on the F-15E, and that was using the Universal Armament Interface,” . ..There is also some work left for the Strike Eagle, specifically integrating the F-15E’s Northrop Litening Advanced Targeting Pod. The continued rollout of the JASSM-ER comes as flight testing of the anti-ship derivative (LRASM) begins on the B-1B for fielding in 2018 and the F/A-18E/F in 2019. ....by the time the Block 5? upgrade arrives the AF will have operated the U.A.I. missile (with the Litening Advanced Targeting Pod) allowing for tactics and operations experience to enhance the "A" updates and also the "C" as it replaces the remaining nine F-18 USN/ USMC squadrons; not including the many "B" USMC squadrons! OMG!, is the "canoe club" actually ahead of the game by only progressing the LRASM on the SBug, and waiting for the AF to implement the Block 5 missile on the F-35 A/B/C!! What's the current schedule for JSOW/JSOW-ER integration? 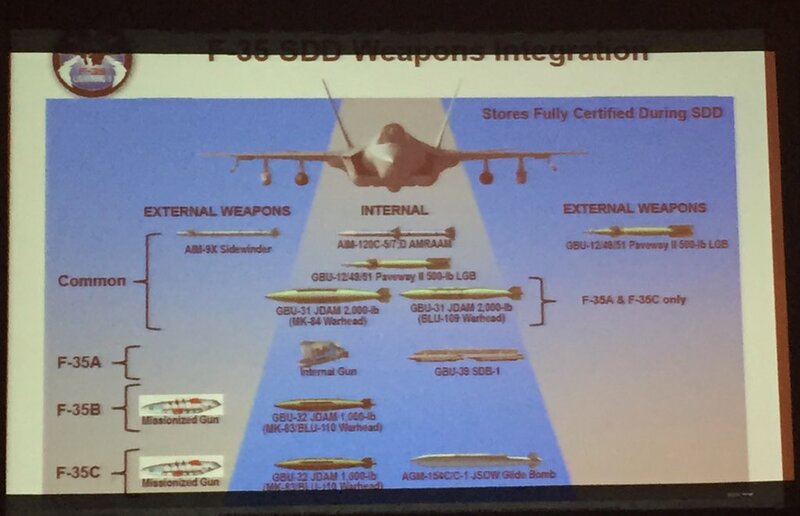 Less urgency to integrate JASSM-ER on the F-35. OTOH the legacy fleets' ability to hold targets at risk will be greatly enhanced. wrightwing wrote: What's the current schedule for JSOW/JSOW-ER integration? [Edit:] And no, to my understanding it's not being integrated onto the F-35A, not until (possibly; customers buying the JSM might not have any use for it) in Block 4. Software-wise, JSOW is in Block 3F but is disabled till sep tests (due to no customer need). The point I'm getting at, is that JSOW/JSOW-ER will be available in the more near term, to provide extended stand off capabilities, until JASSM-ER integration. The higher priority is the F-16/18, and B-52/1B, as they can't get close to high threat targets. The F-35s can fly in undetected, and provide the targeting data, for the legacy fleet. Is JSOW-ER even a PoR yet? SpudmanWP wrote: Is JSOW-ER even a PoR yet? There's money for a Phase 3 end-to-end flight test. JSOW order extends the production line; line shutdown was imminent. For Block 4, (aside from B61-12) AARGM-ER would be my highest priority. USN has always been the big backer/user of JSOW, I wonder why USAF was never interested since USN uses 'em in a lot of mission profiles (usually related to SEAD) very similar to what USAF could. Just a guess but AFAIK the AF stopped JSOW procurement in 2005 and perhaps had to do with the forthcoming availability of the F-35 and it's ability to penetrate into denied airspace. marauder2048 wrote: JASSM came along. I'm not sure JASSM had anything to do with the SEAD mission that is favored by USN for JSOW.